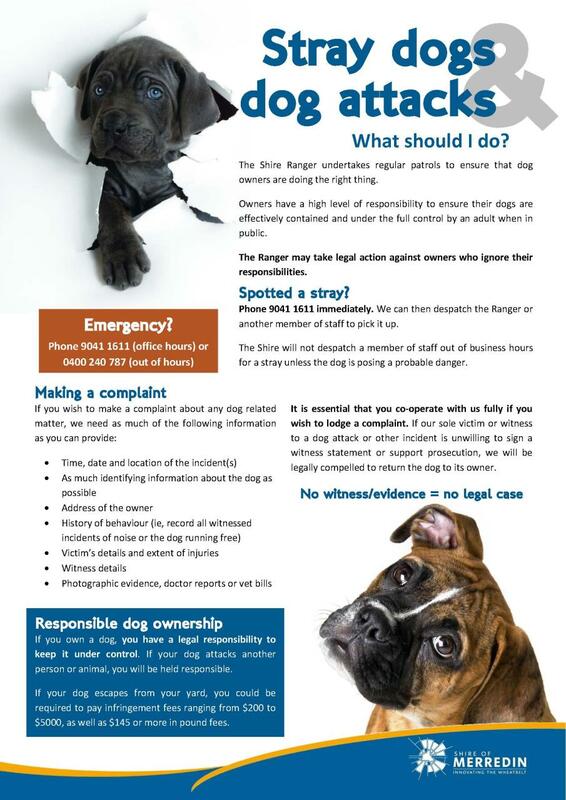 The Shire Ranger can investigate compliance within the community with the various local laws adopted by Council including - parking, thoroughfares, dogs, local government property, fencing and health. The Shire of Merredin generally only investigates complaints where full contact details are provided. The Shire maintains complainant details as confidential, however, these are subject to the requirements of the Freedom of Information Act 1992. The Ranger provides services to three (3) Wheatbelt Shires – Merredin, Westonia and Nungarin. Under the provisions of the Dog Act 1976, all dogs within the Shire over the age of three months must be registered. Registration is carried out at the Shire offices during normal office hours and is available for 1 year and 3 year periods, commencing on 1 November each year. All dogs must be contained on an owner's property or held on a lead at all times. 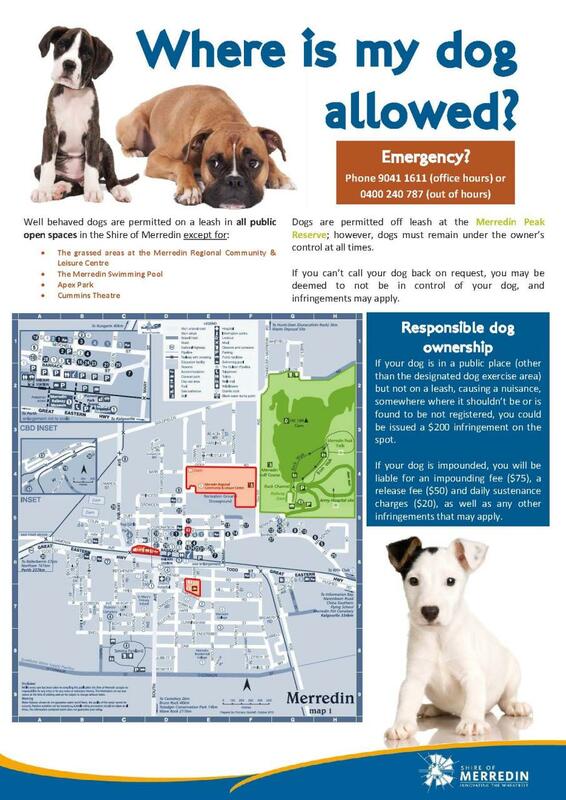 The Shire of Merredin is concerned by the incidence of dogs roaming at large and your cooperation in registering and maintaining control of your dogs will be appreciated. Substantial penalties may be imposed for non compliance with dog control legislation. Click here to download print versions of the posters below. Working dogs are 25% of the above fees. Please be aware that before releasing a dog or cat from the Pound, payment of the below fees must be made at the Shire Administration Centre during office hours (8.30am to 4.30pm Monday to Friday). The dog or cat must also be registered or additional infringements will apply. Please note that off road vehicles driven on roads and footpaths is an illegal activity which should be reported to police. Council has Parking Local Laws, which designate specified areas for restricted parking. Disabled parking areas are also designated. These laws also make it illegal to park on footpaths or restrict access to public thoroughfares. Please note that compliance with Council’s Parking Local Laws is compulsory. It is against the law to park or stop in a parking area for people with disabilities unless the driver or the passenger is a person with disabilities and is displaying an ACROD sticker. Disobeying this law is an offence and an infringement will be issued to any vehicle parked in a disabled bay failing to display an ACROD sticker. Council does not allow camping in reserves other than those designated. Council has a variety of local laws. Click here for more information. Council has regulations pursuant to the Bush Fire Act 1954 with regard to fire control. These include specifications on firebreaks and restricted burning dates. Annually when the Rates Notices are sent out at the beginning of the financial year a copy of your annual 'Firebreak Order' is included. Extra care should be taken to retain this document as it has useful information relating to bushfire emergencies and also contains what you, as a property owner, need to do as per the Bush Fire Act 1954 to make sure your property is prepared for bushfire season. FAILURE TO COMPLY with the 'Fire Break Order' can result in the issuing of a fine from the Shire. Click here to download a copy of your Firebreak Oder 2018/19 which contains important dates like the Restricted & Prohibited Burning Periods. The Shire of Merredin issues HVMB's in accordance with the Bush Fires Regulations 1954. The ban will be imposed when the Chief Bushfire Control Officer believes that the use of engines, vehicles, plant or machinery during the prohibited burning times is likely to cause a fire or contribute to the spread of a bushfire. To find out if there has been a HVMB imposed please call the Harvest Ban Hotline on (08) 9041 2999. You can also be added to the HVMB SMS notification list by contacting (08) 9041 1611. A TFB will be declared by Department of Fire and Emergency Services (DFES) when extreme weather conditions are likely to result in a high risk of bushfire or if existing bushfires are stretching fire-fighting resources. A TFB prohibits the lighting of any fires in the open air as well as any other activities that may start a fire. This includes open air fires for the purpose of cooking or camping, incinerators, welding, grinding, soldering or gas cutting. To find out if DFES has imposed a TFB you can visit the DFES website. Information on bushfire safety can be viewed at DFES Fire Chat.